Other than the green, white and red stripe, the Gallardo Tricolore also sports carbon-fiber mirror caps and a white paint. “To celebrate the 150 years of Italian unity we felt that it was appropriate to propose a tri-color livery for our most succesful model, the Lamborghini Gallardo," said the company's CEO, Stephan Winkelmann. “With the Lamborghini Gallardo Tricolore we give a further impulse to the development of the 'Made in Italy' label in the world." 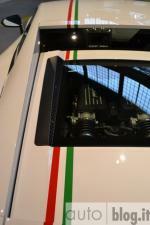 The car will be officially introduced on March 16 in Turin, at an exhibition dedicated to the Italian state anniversary. For the time being, Lamborghini offered no technical details of the special edition model and has yet to announce the number of cars it plans to build, though our bet would go to 150."